Home > Articles > Materials > Your guide to choosing porcelain benchtops in the kitchen. Your guide to choosing porcelain benchtops in the kitchen. Porcelain benchtops are now available in Australia. 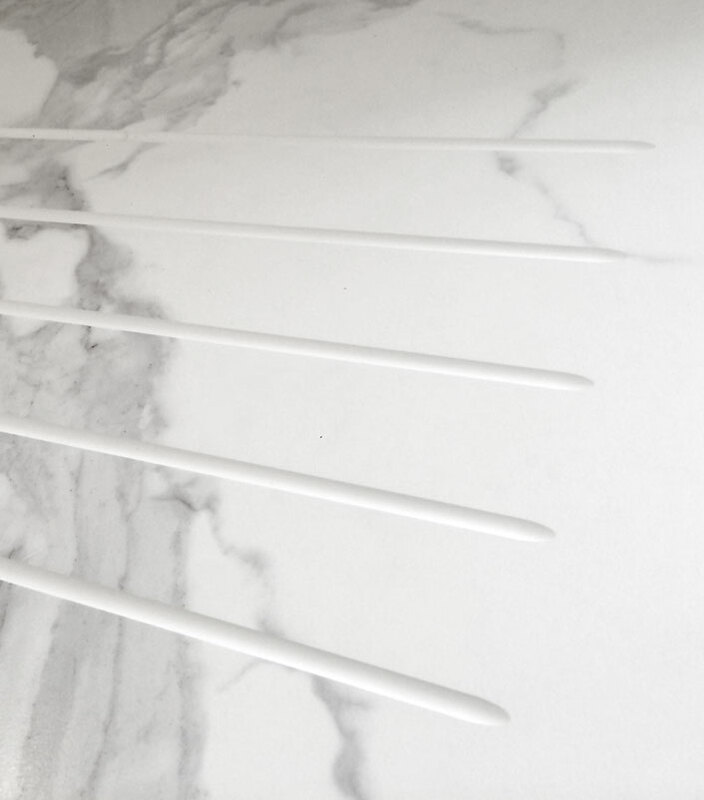 Porcelain benchtops have just hit Australian shores, but what is a porcelain benchtop and why should you choose it for your kitchen? This guide aims to fill you in on this new material. What is a porcelain benchtop? Porcelain benchtops (also known as sintered compact surfaces or ultra compact) are made of high-density, low-porosity ceramic slabs. Porcelain is a new material to be used as surfacing in the kitchen and may well be the product that ends our love affair with quartz-based stone. Many of the properties that make quartz-based stone (like Caesarstone or Smartstone) so popular are also present in porcelain, with a few superior properties quartz-based stone does not have. How are porcelain slabs made? Porcelain benchtops are made of powdered clay and coloured pigments bonded together at extremely high temperature and pressure. Due to the fine particles used the surface can be formed with different textures, from smooth to bumpy. Designs can be printed onto the surface to mimic a range of materials from wood, concrete, marble and limestone. 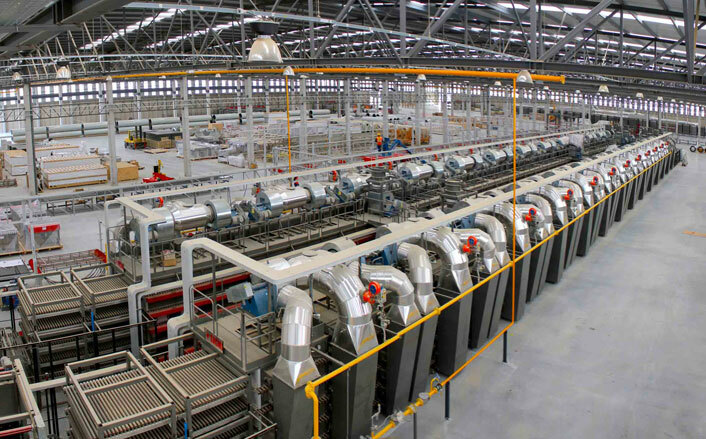 Big business: Inside the Cosentino factory making Dekton slabs. When is a good situation to use porcelain? Food preparation zones: Its high density and low porosity makes porcelain ideal for use in food preparation zones. The material is highly resistant to foods and liquids absorbing into the surface, where in other low density materials stains and bacteria can develop (think of red wine rings on Marble). Porcelain’s hardness also makes it excellent around cutting surfaces as it has exceptional scratching and abrasion resistance. We wouldn’t recommend doing this to your new porcelain benchtop. Ideal around gas cooktops and ovens: Porcelain is heat and fire resistant, making it an excellent benchtop and splashback surface around gas cooktops and ovens. In some other benchtop materials such as laminate, the heat can cause the surface to delaminate and dis-colour. Won’t fade in sunlight: A high UV resistance means a porcelain benchtop will not fade in direct sunlight. A great new material for outdoor barbeques. Some other solid surfaces are also UV resistant, always check with the supplier or your kitchen designer. Great for long islands: Porcelain slabs are currently manufactured larger than standard 3m long quartz-based slabs, avoiding seams or joins in long islands up to 3.2m and 1.6m wide. Cladding onto surfaces: Matching porcelain panels and tiles are also available. They are much lighter and thinner (down as low as 3mm thick) and are great for feature walls, applying to kitchen doors, drawer fronts, and splashbacks. Porcelain panel cladding on bar backing. When you want the look, without the drawbacks: The manufacturers have had mixed success at replicating other natural materials. 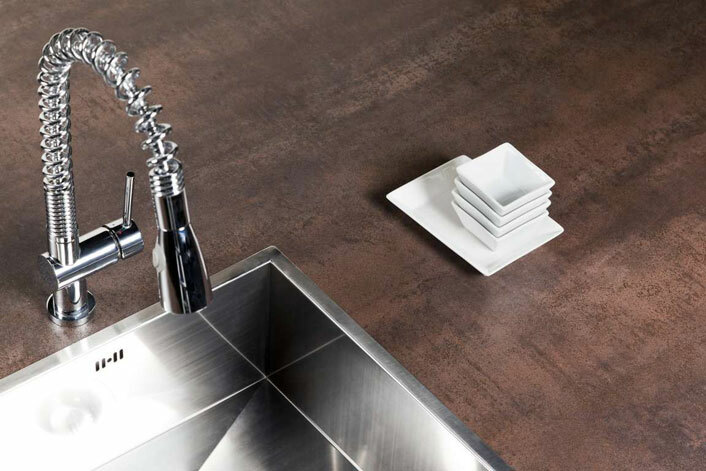 Neolith’s rusted steel range for us at Dan Kitchens looks like the real thing without the risk of tetanus. On the other hand their Statuario still looks okay, but does not have the translucency and variation in pattern that real marble has. Whatever your opinion, porcelain has far superior durability than both of these materials. What are the drawbacks of using porcelain benchtops in the kitchen? Heavy material: It is very hard, but that hardness makes it very heavy (as heavy as Granite). Firstly, your kitchen company will need to ensure the cabinets can take the weight, and that the benchtop is supported correctly at any overhangs. In some circumstances these limitations can be overcome by using a thinner porcelain slab or panel. Brittle and difficult to repair perfectly: Hardness also makes materials more brittle. Porcelain benchtop edges can be chipped and shattered much like glass by impacts with heavy implements. Chips are repaired with an epoxy acrylate resin of matching colour, but the end result is never perfect. The skill of the stonemason doing the repair is the major factor in the success of the repair. Visible seams at mitred edges: In instances where the slab is of uniform colour and grain patterning you will have no problem in having a neat mitred edge (a mitred edge is created by cutting the edge of two slabs at 45°, joining the two pieces together and rounding the point where they join (see image)). Mitring is used to give the effect of having a thicker benchtop or for waterfall ends. However, if the colour and pattern of the material is non uniform (such as a Statuario marble look), mitring will remove the colour and pattern at the rounded join (see image), creating a visible seam. Porcelain benchtop replicating natural stone. When edges are mitred, visible seams are revealed. Can’t be welded together: Unlike Corian, it can’t be welded together. If porcelain benchtops need to be joined together (such as on islands longer than 3.6m) there will be a visible grout or glue join line. Printed designs are only skin deep: The designs on porcelain benchtops are ink jet printed onto the surface. When a cut or routed groove is made, the unprinted porcelain underneath is revealed. Milling or cutting a porcelain benchtop removes the printed design revealing the underlying porcelain. Too dense for backlighting: Porcelain’s density also makes it too opaque for backlighting. Other natural stones and Corian do a better job. Can’t be thermoformed: Corian and other acrylic based surfaces are the only solid surfaces that can be heated and moulded into intricate shapes. Need specially trained stonemasons: The stonemasons that make stone benchtops need to be trained in how to cut porcelain properly and have the right equipment. This comes down to two things; its hardness, requiring special tools to cut it; and due to the pent up stresses in the material being released while cutting. Check your kitchen company and their stonemasons have experience with porcelain. Relatively expensive: Being a new product with little direct competition makes it an expensive material. At the moment, it is priced above quartz-based materials and Corian. Our stone masons have also reported that it takes twice as long for them to work with, adding extra labour cost to the customer. As you can see there is a lot to consider. 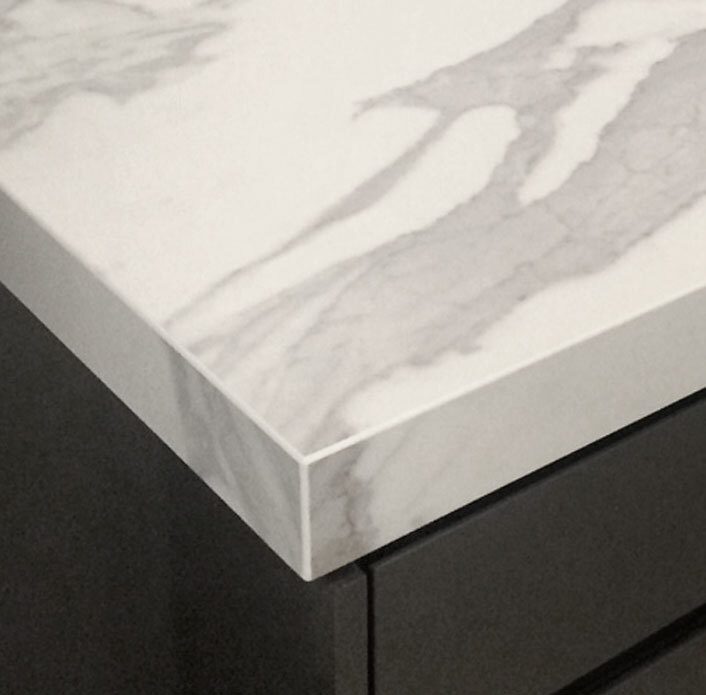 Should you immediately go out and order a porcelain benchtop? It depends mainly on your budget and whether you’re happy with the appearance of porcelain. If you have a high budget and are happy with one of the finishes currently in stock, then porcelain is a great choice for you. If however your budget doesn’t stretch so far and are very fussy with getting just the right look (especially a natural stone) you’d best stay with a quartz-based stone. There are currently a few main porcelain slab brands in Australia; Dekton, Neolith, Maximum and Quantum Six+. All manufacture slabs, panels and tiles in varying sizes and thicknesses. 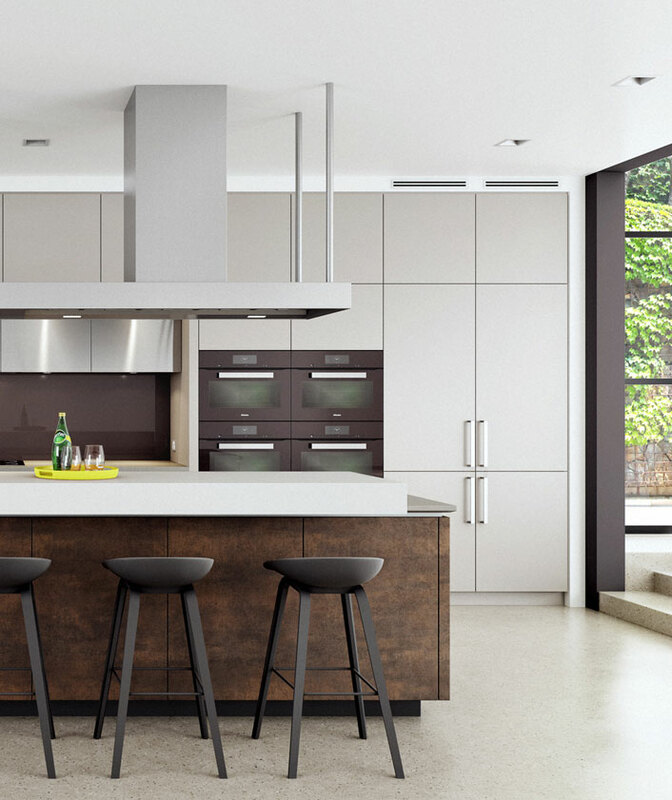 We’ve mentioned a few other benchtop materials in this article, for a more thorough comparison see another article of ours: A buyer’s guide to kitchen benchtops.